I have worked with dynamic marketing executives that want to keep a pulse on their marketing efforts. I have been asked previously to build a sales funnel chart and have had little success in the past. 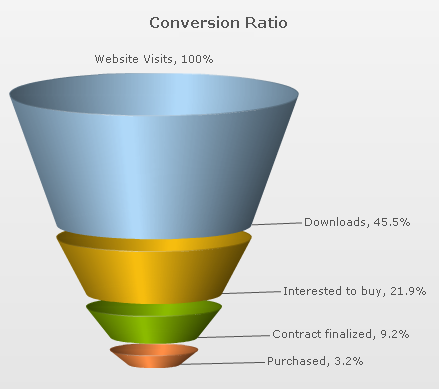 Funnel charts are a type of chart, often used to represent stages in a sales process and show the amount of potential revenue for each stage. This type of chart can also be useful in identifying potential problem areas in an organization’s sales processes. A funnel chart is similar to a stacked percent bar chart. What is it? Conversion rates between stages tells you the percentage of opportunities that your team of sales reps is progressing from one stage to the next and so on down to the bottom of the funnel, where they are converted into deals. Why is it important? This sales funnel report could be the most critical tool for sales coaching. Looking at this report gives managers the strengths and weaknesses at specific stages of the selling process. How to use this sales funnel report? Once managers have ascertained at which stages they are losing the most opportunities, they can go to work fixing those stages, or plugging leaks in the sales funnel. Answering the questions asked by this sales funnel report could lead to dramatically improved sales performances. You will need a login or sign up to see the video. This technique doe require some advanced skills in Tableau report writing but will be worth the hooked smile and nodding approval of your marketing executive! NHIS is a Tableau Alliance partner. We provide installation, configuration and development services for Tableau products. Contact NHIS, Inc today for more information.